These pale green peridot diamond halo earrings are perfect for year round wear and feature a sparkling diamond halo around a genuine 6mm green peridot gemstone. Set in 14k white gold, the peridot gemstone, which is AA rated and a stunning round cut, is surrounded by several H-J color quality rated and I1-I2 clarity rated diamonds, which lend a breathtaking halo effect to the beautiful peridot stone, as well as 0.125 carats! These earrings from Apples of Gold Jewelry feature a friction push back design closure, which makes it easy to keep the earrings securely in place. 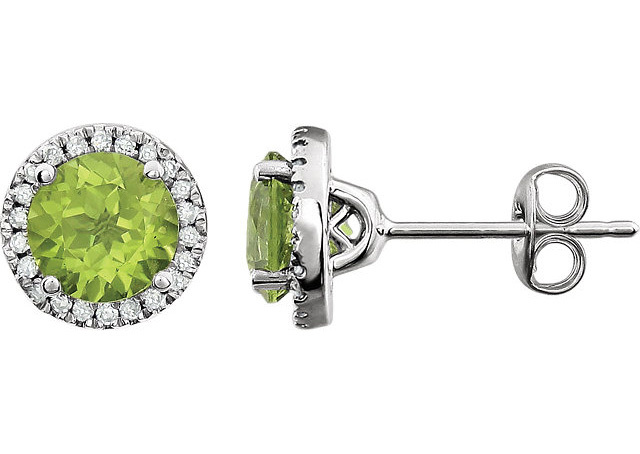 We guarantee our Green Peridot and Diamond Halo Stud Earrings to be high quality, authentic jewelry, as described above.